An innovative UCL artist has hit a rich seam of life in old coal mine water and created five new commercial fine art paint colours, which will be launched at a ground-breaking exhibition this month (April). Visual artist Onya McCausland (UCL Slade School of Fine Art) has teamed up with the Coal Authority to create a series of new British earth pigments from ochre sludge that will help to change perceptions about our industrial past. On Thursday 26 April, the artist will be opening Five Colours / Five Landscapes, an exhibition of wall paintings in the UCL cloisters, featuring the five new colours that derive from mine water treatment schemes across five former coalfields in Scotland, Lancashire, Yorkshire and South Wales. The new pigments have been given the seal of approval from the paint producers. Artist paint manufacturer Winsor & Newton have said that the ochre materials compete in quality with currently available commercial artists' paints. The Slade School graduate discovered the new natural pigments after visiting a number of the Coal Authority's mine water treatment schemes sited across five former British coalfields. The Coal Authority has 75 mine water treatment schemes which prevent 4,000 tonnes of iron solids from entering and polluting local watercourses and drinking water aquifers. 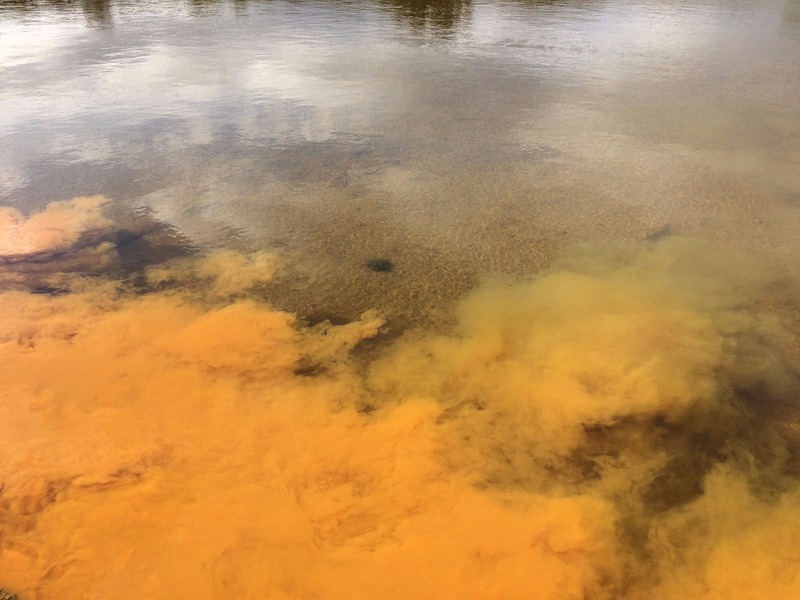 Once treated, the clean water enters local watercourses, and leaves behind iron solids at the treatment scheme that would stain riverbeds orange if left untreated. This is the ochre (or ferric oxy-hydroxide) by-product which Onya is using to prepare new pigments for use in paint. Onya travelled around the country collecting samples of ochre to take back to the laboratory and then her studio, where, through painting, she discovered striking differences between the colours depending on their geographic location. Working with chemists from UCL and the Coal Authority the artist has been carrying out various trials on the ochre. It has been milled and burnt; examined under electron microscopes; and subjected to light fastness tests to fully develop the potential of each colour. The exhibition in the UCL cloisters, together with other further events, will be the culmination of three years' work for the artist, who was recently awarded a PhD from the Slade School on the origins of earth colours and their contemporary significance in painting. A formal agreement between the artist and the Coal Authority is being arranged, which will result in the mine water treatment schemes where the selected ochres are produced being promoted as 'Public Works of Art' in their own right. It means that Cuthill in West Lothian, Scotland; Deerplay in Bacup, Lancashire; Saltburn in East Yorkshire and two in South Wales - Six Bells and Tan-y-Garn, will become the first-ever functioning industrial sites to become public works of art. By doing this, the sites, and their colour, will be recognised and acknowledged as part of Britain's cultural, social and industrial history. "The work requires an examination of materials from different perspectives, view points and across various scales - it is not only about discovering new colours, but also considering alternative ways of perceiving. "These pigments and art works have come into existence thanks to human activity and are not only beautiful but also highlight the intricate relationship between humans and the way they exploit the local landscape. The mine water treatment schemes are the really important link between the colour, the material, and the place," said Onya McCausland. "This is a very exciting 'first' for the Coal Authority. Seeing our ochre turned into pigments that are 100 per cent natural and highly desirable within the artistic world is fantastic," said Jon Aumônier, Innovation Project Manager (Coal Authority). The project has been funded and supported by a UCL Knowledge Exchange and Innovation award from UCL Innovation & Enterprise. The project is also supported by Dr Steven Schooling UCLB, UCL Culture and the Material Research Project which is co-led by Jo Volley, Deputy Director (Projects) at the UCL Slade School of Fine Art. Ochre lagoon, Saltburn mine water treatment site. Credit: Onya McCausland and UCL.